Blockchain in Healthcare Today (BHTY) is the preeminent open-access international peer-review journal for strategic thought leaders, new-era practitioners, and future society stakeholders engaged in DLT and intersecting innovations in healthcare. The online only journal is published on a continuous basis in order to accelerate sharing of rigorously vetted theoretical and experiential knowledge required for a growth sector. Authors are invited to submit original manuscripts, use cases, unpublished research, and defensible opinions on a broad spectrum of topics ranging from theory to science, technologies and methodologies, pilots and scalable deployments, operations and economics, user experience and Return-on-Adoption, legal and regulatory, transformation and disruption, and ecosystem and societal issues relevant to blockchain and converging technologies in healthcare. A world-class peer-review board endeavors to offer rapid, peer-review. BHTY has garnered over 24,000 downloads , 36 citations, and is read in over 70 countries worldwide. 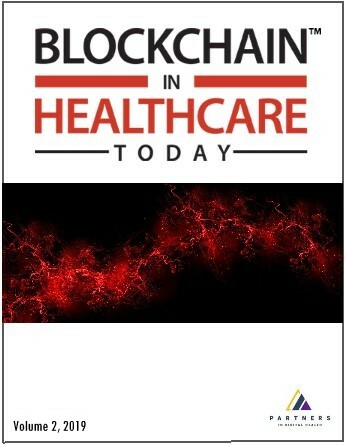 With over 20,000 downloads and readership in 65 countries worldwide, Blockchain in Healthcare Today (BHTY) is the preeminent open-access international peer-review journal for strategic thought leaders, new-era practitioners, and future society stakeholders engaged in blockchain technology and intersecting innovations in healthcare. The online only journal is published on a continuous basis in order to accelerate sharing of rigorously vetted theoretical and experiential knowledge required for a growth sector. Authors are invited to submit original manuscripts, use cases, unpublished research, and defensible opinions on a broad spectrum of topics ranging from theory to science, technologies and methodologies, pilots and scalable deployments, operations and economics, user experience and Return-on-Adoption, legal and regulatory, transformation and disruption, and ecosystem and societal issues relevant to blockchain and converging technologies in healthcare. A world-class peer-review board endeavors to offer rapid, peer-review (14 days), and includes constructive commentary to strengthen work. Response to Zolfaghari et al. We invite to you to submit a manuscript to the first international peer review journal dedicated to blockchain and converging technologies in healthcare, Blockchain in Healthcare Today (BHTY). Averaging three article downloads per hour and over 20,000 total downloads from 65 countries since its launch in March 2018, BHTY is the preeminent open-access international peer-review journal for strategic thought leaders, new-era practitioners, and future society stakeholders engaged in blockchain technology and converging innovations in healthcare. The journal is published on a continuous basis in order to accelerate sharing of rigorously vetted theoretical and experiential knowledge required for a growth sector. Authors can include relevant software code and data in the peer review process by uploading it to BHTY’s Code Ocean computational reproducibility workflow; and strengthen the validity, attribution, and trust-based reputation of their work with BHTY’s ARTiFACTS.ai service option, a purpose built blockchain-enabled platform for academic and scientific research and development. A no-deadline, continuous, two-week submission-to-decision turnaround by world-class peer-review board includes constructive commentary and offers the opportunity for authors to strengthen their work. Happy to help you join this exciting international community engaged in blockchain technology and converging innovations in healthcare. Articles and content are FREE! All you have to do is register with BHTY. BHTY is an open-access publication and does not require subscriptions. We invite you to receive announcements and updates on the latest articles and special editions as they are pushed live. To subscribe, it's FREE, click here. Blockchain in Healthcare Today accepts manuscript submissions on a rolling basis. We publish articles on a continuous basis - that means, as they are accepted, they are pushed live and time stamped, not issue stamped. We want the journal to reflect timely global community efforts featuring new era thinkers and pioneers leading the marketplace to ultimately transform and dramatically increase the quality of healthcare around the globe. Your contributions are paramount to achieve this goal. Blockchain in Healthcare Today has partnered with Code Ocean. Authors can now transparently share code associated with their research, with readers. BHTY now available on Alexa!!! BHTY is now available on the Alexa Flash Briefing. Enable the BHTY Flash Briefing on your Alexa App today! A special thanks to BHTY intern, Alexander Zaleski - a most talented student at UCONN!